safety distances should always be scrupulously respected. A. What does it involve? It provides the consumer with clear information on fuel consumption, safety characteristics on a wet road and the noise that the tyre produces. B. How do I read this information? This indicates the level of rolling resistance. The rating scale varies between A (the most economical) to G (the least economical). 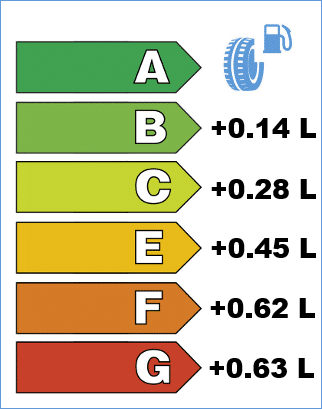 The fuel saving generated each year by the best tyre compared to the worst is approximately 90 litres. Over the entire lifetime of a tyre, the fuel saving amounts to around five full tanks (i.e. 240 litres with average fuel consumption of 7 litres/100 km and estimated annual mileage of 15,000 km for a tyre lifespan of 40,000 km). This indicates the braking performance on a wet road. The rating scale varies between A (shortest braking distance) to G (longest braking distance). This criterion is calculated on the ability of the tyre to stop a vehicle at 80 kph. The difference between each level corresponds to two car-lengths (i.e. approx. 3 to 6 metres). Braking distances increase considerably for tyres with a high rating. 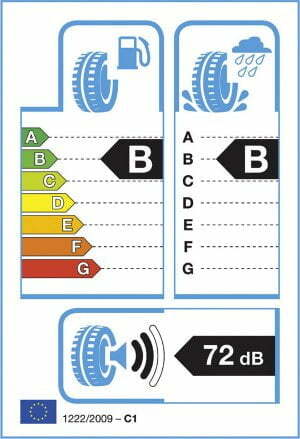 Not measured: from 1/11/2014, F and G rated tyres will no longer be sold in the EU. This is the noise outside the vehicle caused by its movement. This rating is expressed by two values. Waves: one to three full bars. The sound level corresponding to these waves. Today, the European standard is three full bars, the basis on which the calculation is made. From 2016, the standard will be two full bars (i.e. approximately 3 decibels (dB) below what it is today). A continued increase in the technical manufacturing level of tyres in the interest of continually improving product quality. Guiding the consumer in his/her choice of which tyre to buy. The EUROPEAN LABEL does not cover all the determining elements and criteria for the efficiency of a product. Some, such as the braking distance on a dry surface, the resistance to aquaplaning, interior noise and road holding on a bend are not mentioned in the new labelling. These items are therefore additional tyre ratings for Pneus Online customers that you can find in the product data sheet for the tyre in question. Tyres designed only for fitting on vehicles first registered prior to 1 October 1990. T-type spare tyres intended for temporary use. Tyres fitted with devices to improve traction (for example studded tyres). Tyres designed only for fitting to vehicles intended exclusively for racing.